Traumatic dental injuries can occur in people of all ages and activity levels. The cause might be a car accident, a fall down the stairs, or an elbow to the face during a basketball game. As with most types of dental treatment, the primary goal when treating a traumatic dental injury is to save teeth at risk of being lost, and restore them to full function and normal appearance. In many cases, the difference between saving and losing a tooth depends on taking the proper action in the immediate aftermath of an injury. 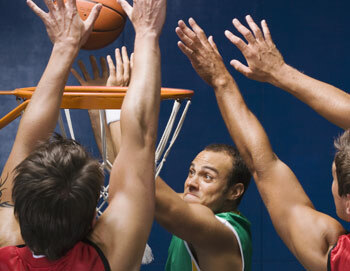 Here are some guidelines on how to prevent sports-related dental injuries and what to do after a dental injury occurs. Americans of all ages love playing sports — so much so that participation in high school sports has been increasing for 24 consecutive years, according to one survey. Yet to gain the very real benefits that sports offer, it's necessary to accept — and prepare for — the risk of injury. Dental trauma accounts for a significant portion of all sports injuries, yet so many of these injuries are preventable. How? With a high-quality mouthguard. When you consider that the lifetime cost of replacing a permanent tooth has been estimated to exceed $20,000, a good mouthguard is one of the best investments you can make in sports equipment: It has been shown to reduce the risk of sports-related dental injury by 60 times. The best kind of mouthguard is one that comes from your dentist's office. It's custom-made from a model of your own teeth, so it's strong, lightweight, and perfectly fitted. 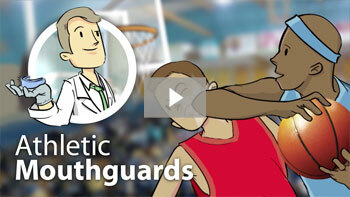 If you (or your child) are active in sports, ask about this indispensable piece of safety gear. And continue reading below to find out what to do in the case of specific types of dental injuries. Chipped teeth are the most common dental injury, according to the American Association of Endodontists. If teeth have been chipped or fractured, or if they are loose or tender to the touch, make sure to see a dentist within 12 hours. Try to locate any pieces of the tooth that have come off, as it may be possible to reattach them to the crown with tooth-colored bonding material. 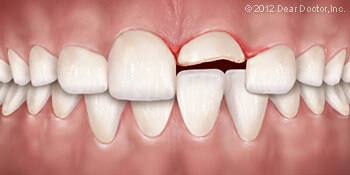 If a permanent tooth has been knocked out of its socket (avulsed), immediate attention is required. First, recover the tooth — and if it's dirty, gently clean it off with water. Try not to touch the root portion of the tooth. Next, if possible, place the tooth back into its socket (making sure it is in the proper orientation), and apply gentle, sustained pressure to the area for five minutes. 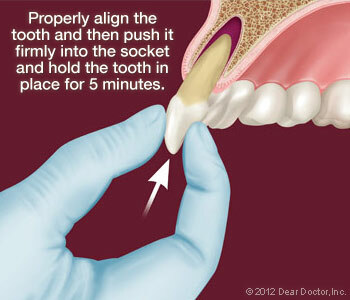 You can use a wad of wet tissue or gauze to help grasp and hold the tooth in place. Get emergency dental treatment as soon as possible afterward, and be sure to check whether a tetanus shot or booster is needed. If it isn't possible to replant the tooth, have the patient hold it between his teeth and cheek, or place it into a plastic bag with the patient's saliva, or into a cup of cold milk. Control bleeding from the tooth socket by applying pressure to the area (use gauze if possible), and get the patient and the tooth to an emergency treatment center as soon as possible. Primary (baby) teeth, however, don't usually need to be replanted. If teeth are driven into or pushed partially out of the jaw, or if they are out of alignment, the patient should see a dentist or oral surgeon within six hours of the accident. A careful examination of the mouth (plus x-rays if needed) should reveal the extent of the damage, and indicate what restorative treatments are likely to be required. In addition to the teeth, dental injuries often involve damage to the gums, the tongue, and the inside of the mouth. When these soft-tissue injuries occur, it's best to take the following immediate actions, and then see a dentist as soon as possible: Wash and rinse the area with soap and water if possible, or remove debris and foreign material by hand. Bleeding can usually be controlled by applying direct, gentle pressure to gauze pads placed on the wound. If it can't be controlled after about 10 minutes, go to an emergency room. Don't hesitate to call the dental office for more specific information about handling a traumatic dental injury. Do you or a loved one snore?